We use reusable snack and sandwich bags, washable hankies and cleaning rags (my toddler barely knows what a paper towel is! ), avoid plastic wrap and styrofoam, cloth diapered for a while, take our own containers to restaurants for leftovers and do our darndest to create as little waste as possible. In fact, I shared 200 ways to practice the 3Rs to save the earth last year and then another very specific 101 things you can reuse instead of recycle this year. You’d think I’d be out of ideas. But when I was asked what to do with bacon grease and some other things that people felt guilty about throwing away (you can’t compost meat products), I knew I had to share just a few more ideas. Did you know lard is over 50% monounsaturated fat? That’s the same healthy fat lauded in avocados. So how do I “dispose” of bacon grease? Into a glass jar, into my fridge (although it can hang out at room temp for many days too), and back into my skillet to pan fry asparagus or green beans. It’s also ah-maz-ing incorporated into hamburgers, about 1-2 tablespoons per pound. It’s what steakhouses do to get that crispy outside and the “what’s the awesome taste?” burger. One caveat is that chemicals, hormones, pesticides, etc. accumulate in the fat of an animal, so if you’ve got conventionally raised store bacon, it’s your call whether you pitch or reuse. 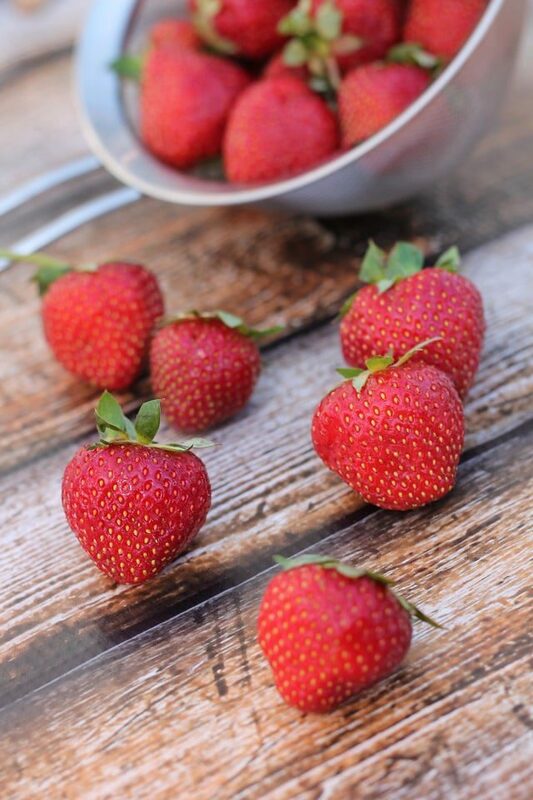 I shared this tip with a neighbor who had just picked many, many pounds of strawberries and was looking at the rest of the day hulling and freezing them. I had asked her how she uses the berries, and when I found out most of them are frozen whole for smoothies, I told her that we’ve been leaving the hulls (the green tops) on for years and are still around to tell about it. We make green smoothies anyway, so those greens completely disappear. This tip may be too late for most of the U.S. strawberry season, but I hope you can remember it for next year and save yourself some time (and avoid that pile of strawberry hulls for the garbage and compost that always makes me bummed out that I paid money per pound for such a heap!). I hope you already know that you can make homemade chicken stock from a chicken carcass, and even that you can reuse the bones three or more times until they’re practically falling apart. But what about when you serve fried chicken or grilled bone-in chicken and have all those un-compostable bones on the plates? Why not put them in your stock too? It’s going to boil and cook four or more hours – will there really be any germs that survive? Nope. So grab those chicken bones, steak bones, and ham bones from the plates and don’t ever throw them away without using them for at least one batch of stock (ham bones go in our slow cooker beans, mmmmmm…). If you just have a few, freeze them in a bag until you have enough for a good pot of stock. If you hide this fact from your family, that’s okay. They might not understand the beauty of reusing! The same “throw everything in the stock” mentality also applies to those slimy bags of internal organs you’ll find inside your chicken, the onion and garlic skins you’ve probably been throwing away or composting, and carrot and celery ends as well as fresh herbs like parsley, cilantro, thyme and more that you can’t use fast enough. Just don’t put greens or broccoli in your stock; they’re too bitter. I guess I could have called this post “Things You Didn’t Know You Could Eat” since that’s the main idea here: Don’t toss it, eat it! What do you reuse that most people just throw away? Very helpful. I do find thatsome gems are OK on stock, especially carrot tops and beet greens. Carrots are a cousin to parsley, green carrot foliage can be used as a replacement either fresh or dried. They get a bit bitter when cooked for long periods, like in stock. I do use all of my bones for stock, and strawberry tops in smoothies (beautiful pic, by the way), but I didn’t know that bacon grease was the magic ingredient in good burgers or that it can be left at room temp. Thanks for the tips! I try not to throw anything away. It either gets eaten by our chickens or dog, or gets put in the compost pile. I don’t know why I never thought to keep the snapped ends of my asparagus — such a good idea! I use my bacon grease for seasoning vegetables when cooking. It only takes a little. We use it to cook pan fried potatoes, too. And it makes really good homemade soap. I also render beef fat to make tallow, and use it in soap making. We use our bits and pieces of left-over veggies to make a rich vegetable soup. We also use the bones from chicken, or beef to make a rich stock. It is then either frozen or canned in a pressure canner. We use and reuse as much as possible. You just never know when we will have to do these things to survive. I take the used bones and veggies from my stock and give them to the dogs to cut back on some of the commercial dog food they get. The bones are crumbly and they love the cooked veggies. Chicken bones are extremely dangerous for dogs because they splinter and can very easily get stuck in their esophagus or rip their intestines! 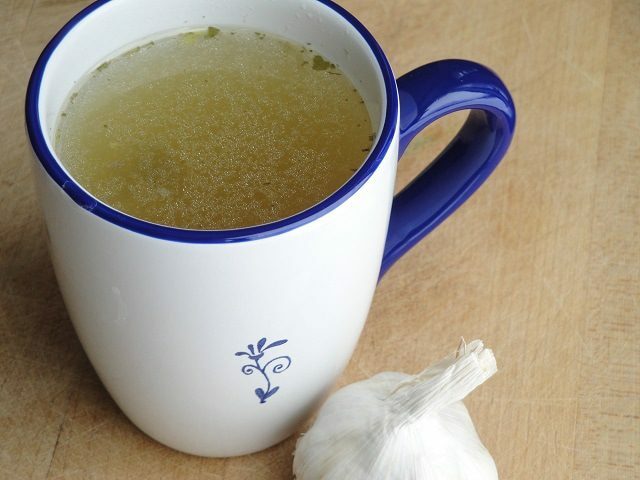 But if you make the bone broth stock the right way, they are soft by the time you are done using them – I’ve had them fall apart in my hand trying to strain out the bigger ones! Thanks for the info on strawberry greens – didn’t know that! Pastured pig lard is high in Vitamin D, too. Bones, after being used for stock, make great bone meal once they’ve gone through the compost pile a few times. Why pay for it for your organic garden when you can make it? Adelle Davis, a nutritionist who wrote many books including “Let’s Cook it Right”, recommended saving uneaten food scraps off of plates, refrigerating them, and making soup using them (and boiling to kill any germs.). I haven’t gone that far yet.. Yes, without the fat. Even if there’s some meat on it, if it’s buried well within carbon-rich materials like leaves, paper, sawdust, etc. the meat will decompose (and not be smelly outside the compost area). But you have to make sure the compost bin/heap is animal-proof or a critter may want to dig it out. It takes awhile for bones to really break down unless they’ve been used for stock 1st. Sorry for not replying earlier – just saw your note. Yes, there shouldn’t be fat on them. If there is meat on them, it may attract animals unless your compost is in a secure container. Any meat or dairy (protein items) will STINK during composting so should be surrounded by generous amounts of “browns” – carbon material to compost with and help absorb the smell. That’s why the official line is not to compost them. There’d be mutiny if I ever threw away any bacon grease, but I had no idea you could eat the strawberry hulls. Thanks for the tip! Our girls use old receiving blankets as hankies during that stage of a cold where your nose just seems to be dripping slightly ALL THE TIME. We actually call them (hides face)….snot rags, although I have no idea where that name came from! They’ll use one for a day and then toss it in the laundry and get a new one. It definitely saves on the gazillions of tissues and they’re nice and soft too! Bethany – totally 100% yes! My kids get cranky when they have a runny nose at school and don’t take enough, because they’re spoiled on the softness. 😉 We actually store them in empty tissue boxes on the top of toilets, just like tissues. One main one for anyone to use, a blue box with blue hankies for the 9yo boy and a pink box with pink hankies for the 6yo girl. A little behind on getting a box for the almost-3yo! They get washed with towels and it’s usually the kids’ job to sort them, so sometimes they are folded but they don’t have to be. I was just eating some wonderful small local strawberries today and thinking about those green tops. If strawberry leaves are edible and nutritious, why wouldn’t those tops be too? Now I don’t have to feel weird for being too lazy to take the tops off! I knew all of this! I don’t care for the taste of the greens so I just ciut off the very tip of the strawberries (usually eaten whole) which is a bit faster than hulling. I always keep all my bones for stock, recently we had steamed lobsters and my mom made lobster stock from the shells (that one does have to be done fast or it stinks up your kitchen). I LOVE veggies fried in bacon grease – gives them the extra flavor w/o so much bad stuff. We give our dogs the green bean tips because they love them but the other veggie peelings go in a bag in the freezer for stock. I have four quarts of stock in my freezer right now, now I just need to come up with something to use it in! I remember my mom and grandmother’s keeping a coffee can on the stove for saving bacon fat.we hardly have bacon, but I make chicken stock and put it in everything. Also, we use almost all of our fruits and veggies …especially berries. I have been tying to not be so stingy…and save a little bit for the chickens. They love all the bits, too, and I get it back in beautiful golden yoked eggs! I had just learned about eating strawberry leaves from our local gardening show. The expert claimed that the greens were full of anti-cancerous nutrients. Mixing them is smoothies is a brilliant use! Skins/peels from carrots, onions, and garlic – into the stock! I’d be careful calling bacon grease healthy. 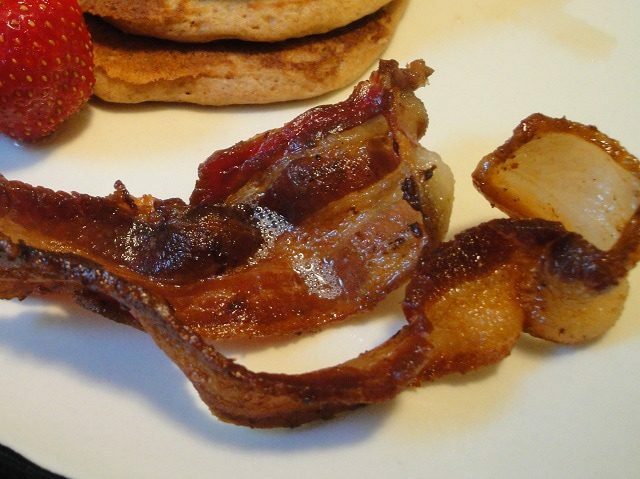 I’m all about natural fats, but bacon is highly carcinogenic. It might be okay to splurge on once in a while, but it shouldn’t be a regular part of your diet.